Found 6 file extension associations related to OneDrive for Windows and 1 file format developed specifically for use with OneDrive for Windows. OneDrive for Windows is the easiest way to access OneDrive from your PC. When you install OneDrive, a OneDrive folder is created on your PC. 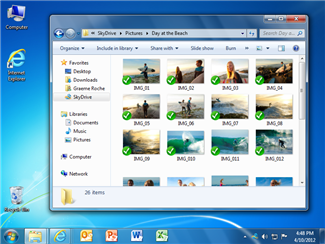 Everything you put in this folder is automatically kept in sync between your computers (PC or Mac) and OneDrive.com, so you can get to your latest files from virtually anywhere. Whenever you add, change, or delete files in one location, all the other locations will be updated. Access your OneDrive right from Windows Explorer—photos, documents, and all your other important files. Quickly add new files to OneDrive by dragging them to the OneDrive folder. Easily organize your files and folders in OneDrive, just like any other folder. Connect back to your PC if you forget to put something in OneDrive. If you need more information please contact the developers of OneDrive for Windows (Microsoft Corporation), or check out their product website.